Whether you are a beginner, intermediate, or you consider yourself an expert there is a sewing machine out there tailor made for your skills. 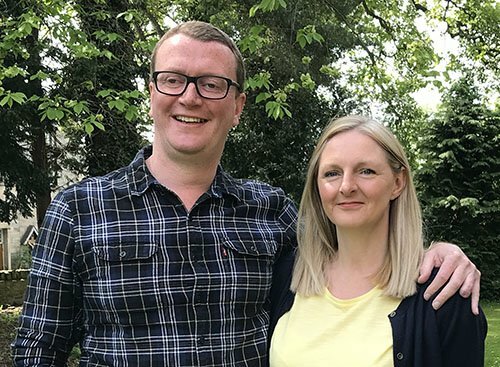 Sure, any beginner can run out and invest in a cheap sewing machine for a £100 or more, but what about once your skills adapt? Spending just a little bit more will get you some additional automated features that could be extremely useful in the future. If you really want to go for top-of-the-line machines that offer the best features in the market you are probably looking at spending in the high hundreds of pounds. However, these machines will produce professional-quality designs that can’t be matched by the competition. That being said, if you are in the market for a sewing machine there really are a lot of considerations and technical aspects that you need to consider. And, at the bottom of these reviews, you can find more details about the technical aspects and considerations. Finding the best sewing machines can be quite a task and to better help you in your search, below you will find some comprehensive reviews of some of the best models available on the market, from small portable machines, beginner friendly models up to more heavy duty machines. Metal chassis, drop in bobbin, LED bulb, 4 step button hole, 3 year guarantee. High speed (1100 stitches/minute), 4 step button hole and 3 needle positions, 4 presser feet. Small portable sewing machine, mains power or 4x AA batteries, 2 speeds, lamp. Heavy duty metal frame, 4 step button hole, foot control. Metal chassis, 4 step button hole, LED lamp, foot control, 3 year guarantee. The Brothers LS14s is one of the best beginner sewing machines. 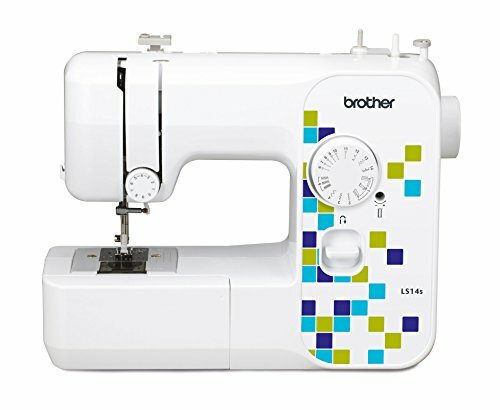 With fourteen different stitching patterns and a drop in bobbin, the Brother LS14S sewing machine really makes those tough and tedious sewing jobs so much easier. The LS14S also features 14 stitch patterns and 4 step button hole. The smart design and well-built metal chassis really only add to the beauty and integrity of this machine. When you combine all of these features with the three-year warranty, you are looking at a well-constructed machine that is backed by the manufacturer with extreme confidence. A lot of new sewing machines on the market are including work lights so that users can always see what they are sewing, even in the late hours of the night. Sure, this is a great feature, but changing the bulb can be a hassle. However, this is something that you will never have to do when you invest in the Brother LS14S Sewing Machine thanks to the LED bulb. In addition to this, the LED lighting system prevents distortion of the thread colours, so you always know what you are working with. A LED lighting system that never needs changing, drop in bobbins, a well-constructed metal chassis, and a three-year warranty, what’s not to really love about the Brother LS14S Sewing Machine? When it comes to pure power and durability, you probably will not find a sewing machine on the market at this price that is built as well as the Singer 4411 Heavy Duty Sewing Machine. 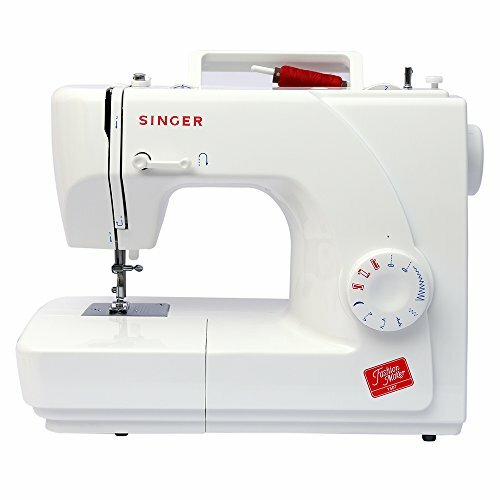 Singer (along with Brother) is one of the best sewing machine brands and this machine is a true workhorse, featuring a heavy-duty metal interior frame, an extremely powerful motor, stainless steel bedplate and an extra-high sewing speed. 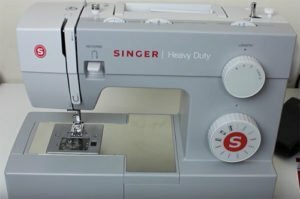 Whether you are looking for a more durable machine or a machine that can accomplish projects in half the time, you have to consider the Singer 4411 Heavy Duty Sewing Machine. 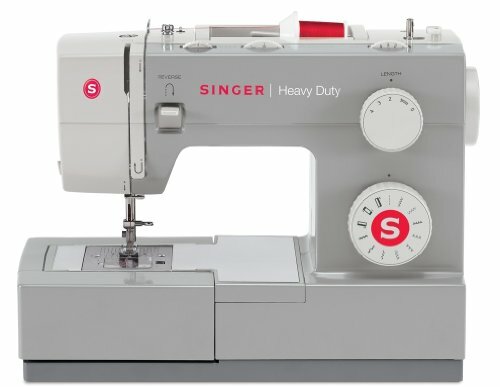 The Singer 4411 Heavy Duty Sewing Machine enables even the most basic of users to complete some of the most difficult sewing tasks. With six basic stitching patterns and four decorations patterns, you can literally complete everything from craft projects to making your own clothing. And, when you combine this with the auto buttonhole stitching option, this really makes those tough projects so much easier. The auto buttonholer feature allows you to sew in a buttonhole in one easy step. You don’t even have to stop and turn the fabric. At the end of the day, if you are going for pure power and speed, you simply will not find anything that suits the profile better than the Singer 4411 Heavy Duty Sewing Machine. At this price, this is certainly one of the best heavy duty sewing machines. 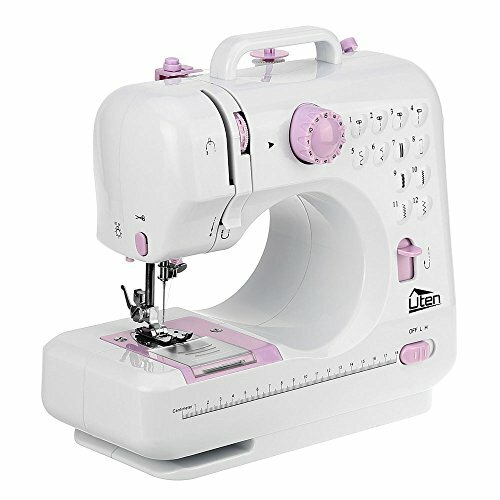 Although, this electric sewing machine comes in a compact and portable design it really is capable of accomplishing some of the bigger sewing projects . The two different speed settings and twelve different stitching patterns really allow users to customise their own projects in a manner of different ways. Circular sewing has never been easier with this machine thanks to the freearm. Whether you are sewing the bottom of cuffs or trousers, the Uten Electric Overlock Sewing Machine will make the project so much easier and smoother. This portable and convenient machine is perfect for the home or road. With the anti-slip pads, you can always rest assured that the machine stays secure and in place when you are trying to complete those crucial stitches. The one button on/off switch really makes the machine all that much easier to operate. The machine even comes equipped with a handy little work light, so that you can always see what you are doing. When you combine the above-mentioned features with the reverse sewing feature, you are truly looking at one versatile machine. The reverse sewing allows you to easily and quickly reinforce ends of seams and other crucial spots. This is certainly not a heavy duty machine but is one of the best portable sewing machines (great if you need to take to classes, for instance). With only eight different stitching patterns the Singer Model 1507 Sewing Machine might seem like a more basic option. While the machine is good for the beginner and basic projects, it does have the abilities to tackle some of the most tedious jobs out there. The eight-stitch sewing patterns allow users to complete a variety of projects. With the simple turn of a dial, you can accomplish everything from fashion sewing to craft projects. You can even tackle home decorating and decorative sewing projects. Not all fabrics are created the same. Some are much bulkier and harder to deal with. This can also be true when you are trying to sew multiple fabrics together. For some machines, this might be a problem, but for the Singer Model 1507 Sewing Machine this is just a simple obstacle that the machine can easily overcome. Thanks to the extra-high presser foot lifter which gives users more clearance so they can place multiple layers of bulky fabric under the presser foot. At first glance the Singer Model 1507 Sewing Machine might seem like a basic machine but once you start considering all the features, you are truly looking at one compact machine that can accomplish a variety of tasks with ease. Whether you are an expert or a beginner, getting used to new a sewing machine can be quite a difficult task. You still have to familiarize yourself with all the new features and buttons. Well, the Brother AE1700 Sewing Machine really makes this easy, as it comes with an instructional DVD. This DVD will not only introduces you to all the features of the machine, but it will show you what they do and how to change them, which makes this the perfect machine for the beginner. And, this is just the beginning of what the machine has to offer. Anytime you invest in a sewing machine, you want to make sure that you are getting quality. And, that is exactly what you are getting with the Brother AE1700 Sewing Machine. The manufacturer is so confident in their well-built machine that they are willing to back it with a three-year warranty. The drop in bobbin ensures that user never has to manually load their thread in a recessed compartment, which means you spend less time reloading and more time sewing. This machine also has 17 sticth patterns and an LED lamp. 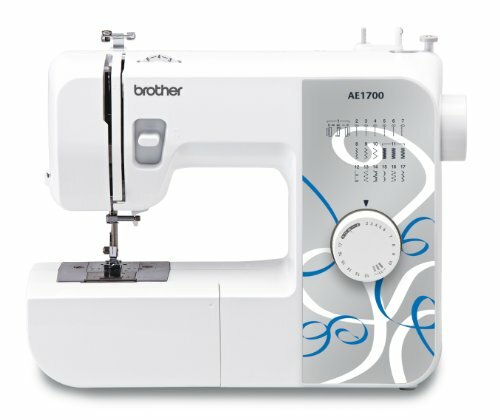 When you look at everything the Brother AE1700 Sewing Machine has to offer, it is easy to see why this is a very popular sewing machine. Before you just blindly invest in a sewing machine, you need to understand the different types that are available to you and how they work. Not only this, but you need to understand what you can accomplish with them. If you sew on a daily basis and have a bigger budget, the electronic models might be your best option. With touchpad controls, LED screens, topstitching, and piping options these sewing machines make some of the footwork and more tedious projects a little easier. When you combine this with the dozens of stitching options, you can truly customise your projects to meet your own specific technical needs. The embroidery machines are the top-of-the-line, as they include all the special features that can be found on the electronic machines, plus more. With these machines, you can accomplish a variety of embroidery projects like garments, pillowcases, and bedspreads. These machines operate a bit different, as they hold a hoop under the needle. As the needle sews it enables the hoop to move in four different directions. This sounds complicated, but it is actually fairly easy thanks to the specifications of the machine. In fact, the specifications for these projects already come built into the memory and if you want to take on newer, tougher projects, you can purchase additional memory cards, CDs, and data sticks that can be linked right from your computer. These accessories will allow you to store more specifications and add pre-loaded specifications with ease. These machines are so well developed that they will tell you when you need to resize, reposition, or even change colours. Any beginner could literally tackle some of the most tedious and toughest projects with one of these machines.